I won't be joining the challenge, but I do hope to read more old mysteries this year. I began the Albert Campion series, but haven't progressed. I haven't read any Marsh at all. And of course, dear Agatha awaits me. charley commented: After reading your post, I went over to Bev's site and joined up for the challenge. 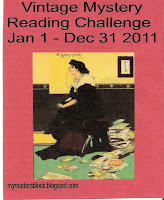 Bev commented: Welcome to the Vintage Reading Challenge! I really hope you enjoy the books you pick out. I'm glad to see that this genre is appealing to so many.